I thought I was playing a goofy, pervy dungeon crawler. I wasn’t expecting a treatise on morality and societal expectations. It’s an old-school top-down JRPG, in which your character has taken a part-time job without looking in to the fine details and discovers that it’s quite a bit different than they believed. Turns out, your new job takes place in Hell, and the goal of the job is to rehabilitate seven girls who were condemned to hell for Earthly sins but who are being given a second chance at life, if they can just make it through a series of dungeons and find redemption. And, yes, there’s a fair bit of spanking, because that’s how you motivate your charges to learn new skills. The actual spanking mini-game is about as visually tame as you can imagine. Little markers fly across the screen at an SD representation of the character and you must press the circle button at the right moment. This isn’t an adult game, it’s just modestly pervy. In between spankings, you traverse dungeon levels, fighting random encounters to level and finding chests full of money or consumable items. Some of the harder-to-find chests unlock new moves for your team. There’s no armor or weapon upgrades, so there’s not a lot of inventory management. This is somewhat refreshing, actually, though people looking for a loot game ala Diablo will not be well served. While wandering the halls of Hell, you are treated to a near-constant commentary from your charges, mostly complaining about how they can’t believe they’re STILL walking and isn’t it time for a break yet and when are we going to take a break and Oh My God MORE dungeon why are you making us doooooo this. This does tend to relieve some of the guilt you may have otherwise felt when it’s spanking time again. Combat is… also interesting. It’s turn-based, and the start of every turn has the characters in your team telling you what they’re willing to do, from which you get to select one option. The options – and thus, the fighting efficacy of your team – are affected by how motivated your team is, so you will have only very basic attacks at the start and then work up to screen-filling lightning storms as you progress through the game. You can also swap characters in and out of the active team during fights, so you don’t get stuck in a situation of needing a particular skill from a particular character but having them warming the bench. So, by now you may be wondering about the way I started this post, so let’s talk about that. After going through several fairly traditional dungeon levels – you get your swamp dungeon, your fire dungeon, your ice dungeon – you find yourself in the modern world, where all of your team members need to confront the Dire Sins that led to their damnation. This is where things may just get a little personal for the player, because these hardened criminals really haven’t done anything wrong. At worst, they’re guilty of the sort of slack that gets most of us through the day. One of them is in Hell because she decided that she didn’t like to go to piano lessons any more, another is there because she got hooked on MMORPGs, failed in high school, and now she’s 20 years old and doesn’t know what she wants to do with her life. This is, I think, the point where the developers decided to metaphorically stab the player with a metaphorical dagger, and every time you unlock a new story, the metaphorical dagger gets metaphorically twisted just a little more. It’s a near certainty that one or more of these Horrible Moral Failings is going to apply to the person holding the PSP, and suddenly the whole dragging the characters through dungeons while happily spanking them so they’ll learn their new heal spell takes on a whole new turn. Hope you never stayed up too late playing WoW! Oh, and the final boss? Well, without spoiling too much, you’re not going to feel good about fighting them, either. 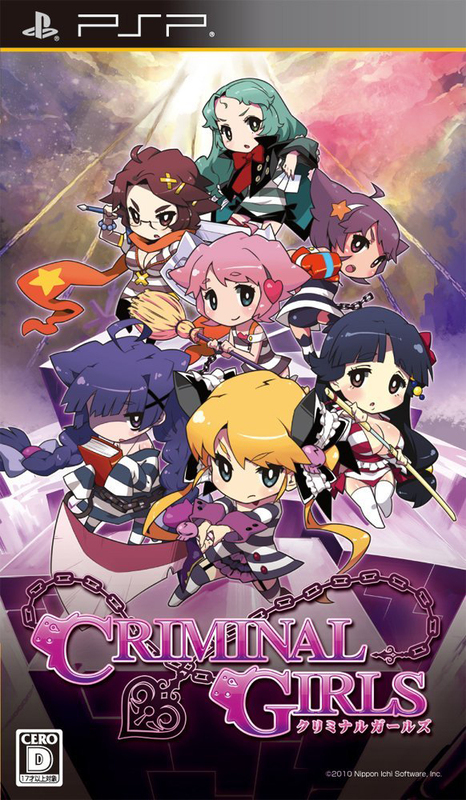 Criminal Girls is a weird game, even for Japan. It sells itself on being ridiculously naughty, isn’t actually all THAT naughty when you actually play it, and hits you with a massive dose of The Feels when you’re about three-quarters of the way in. It got remade for the Vita, and rather surprisingly got a US release, albeit one rather heavily edited for content. I haven’t played that version, so I can’t specifically recommend it, but barring a few years of language study it’s probably your best option.